It is a short swim for salmon. But a great leap for salmonkind. For more than a century a whiskymaker’s dam stopped migratory fish from reaching their spawning grounds on a Speyside burn. Now – as part of a nationwide campaign to bring salmon and trout back to once blocked rivers – Tamdhu Distillery near Aberlour has righted a Victorian wrong. Its owners, the independent Ian Macleod Distillers, have paid for a £120,000 fish pass that opens up a more than two-mile stretch of the Knockando Burn, a tributary of the Spey. The man-made structure is 4.5 metres high and 16 metres long and one of the biggest of its kind in the UK. It comes seventy years after the opening of revolutionary salmon ladder at Pitlochry, which is 310 metres long and designed to let fish pass an early hydro power scheme. Along with other small-scale efforts to remove or bypass weirs and dams, often the legacy of legacy industries, the Tamdhu project is helping to re-open hundreds of miles of river to fish. 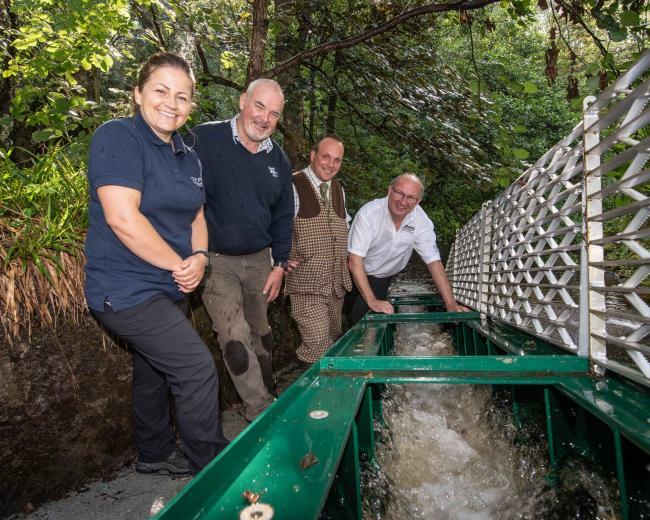 Tamdhu Distillery Manager, Sandy McIntyre, said: “We’re really excited to be working in partnership on this essential environmental project at the Tamdhu Distillery, which will see fish return to this section of the Knockando Burn for the first time in over 100 years.